According to some economists, the current high level of unemployment is “structural” in that it reflects supply-side bottlenecks in the economy. Employers would like to hire, but workers don’t have the right skills. Employers in some states want to hire, but the unemployed workers are stuck in other states where demand is low. The fundamental implication of structural unemployment is that we can’t combat it by working the demand side of the economy. Fiscal stimulus in the form of increased government spending or lower taxes, say, cannot solve the mismatch in skills or geography, so the most such measures would accomplish would be to set off a round of inflation. 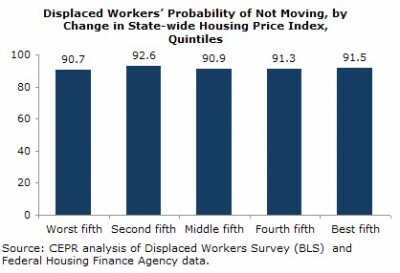 Our paper uses data from the most recent “Displaced Workers Survey” (DWS) conducted by the Census Bureau every other year, to look at two arguments often made for structural unemployment. Well, it turns out that construction workers who lost their jobs in 2007, 2008, or 2009, did about as well after losing their jobs as workers who lost their jobs in other parts of the economy. Source: Schmitt and Warner, 2011. Laid-off construction workers were just as likely to find a new job and held as many jobs after being laid-off as non-construction workers. Construction workers were also more likely to move, and more likely to move specifically to find another job, as non-construction workers. Construction workers were a bit more likely to be unemployed, but they were also a bit less likely to leave the labor force than non-construction workers. And construction workers were just as willing to accept big pay cuts to find a new job as non-construction workers. If construction workers are faring no worse than other workers in the current downturn, it is hard to argue that a glut of construction workers is the reason unemployment has stayed so high. A second argument offered in favor of structural unemployment is “housing lock.” In the past, workers in high unemployment areas would relocate to low unemployment rates, the argument goes. But, now they can’t because they can’t sell their houses in many collapsed real estate markets. Again, the DWS data cast doubt. If housing lock were a problem, we’d expect states where prices fell a lot to have higher “staying” rates than states where house prices fell less or even rose. The graph above, however, shows that the staying rate for “displaced workers” was essentially the same across groups of states ordered by the depth of the collapse in local house prices. It’s likely that construction workers are more likely to stay in the labor force simply because they’re younger than laid-off workers in other sectors. Thanks for the comment. That could well be the case. But, the point that supporters of structural unemployment are making is that we can’t use fiscal or monetary policy to lower unemployment because we have too many construction workers, who are not well suited to the available jobs. If it is the case that construction workers are younger than workers in other laid-off sectors and therefore are better able to stay in the labor force than workers laid-off from other sectors, then we still don’t have a “structural” problem. You are offering one explanation for why we might observe the patterns we see in the data, not an argument for why we really do have structural unemployment. Sorry. I wasn’t suggesting that you were wrong. In fact, I think you’re right, and that this “structural” argument is an attempt to blame unemployment on the worker (they just didn’t get it together to retrain for another occupation, or be more flexible in the first place by training to be both a nurse and a construction worker). I just like to dabble in data, preferably when you’ve already done the work on it.